Detail from “Se Repulen” (They Spruce Themselves Up, c. 1799). 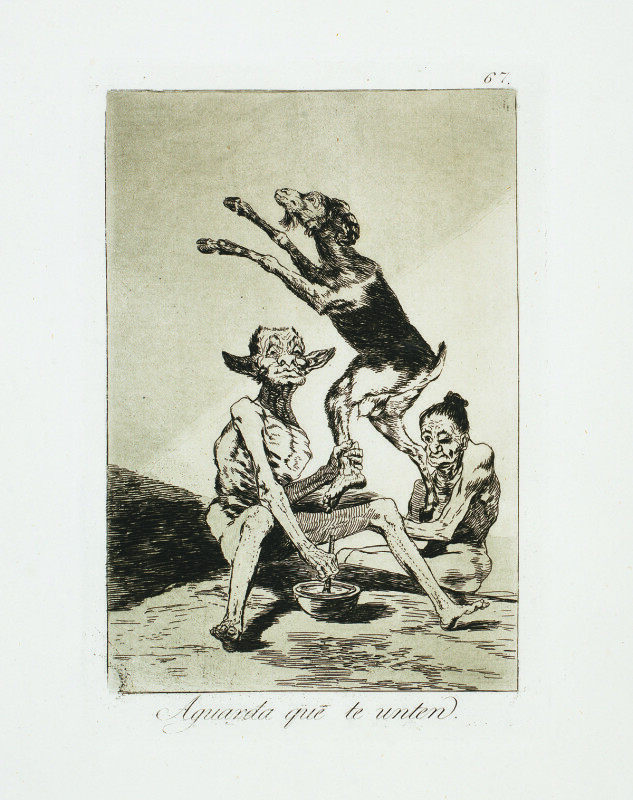 Etching from Francisco Goya’s “Los Caprichos” series. 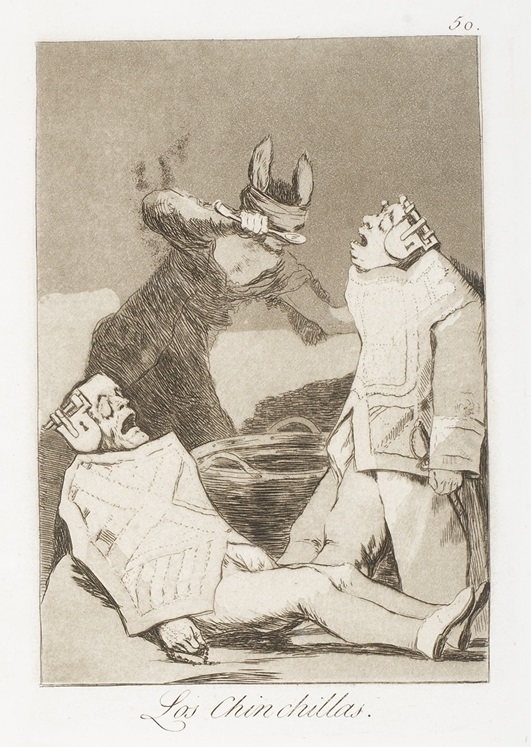 His “Los Caprichos” etchings are made up of 80 plates completed between 1797 and 1799—graphic works that critique both Spain’s culture and humanity in general. Throughout the series, Goya makes trenchant political commentary and references to witchcraft accompanied by bizarre and disturbing imagery. “Los chinchillas” (c. 1799). 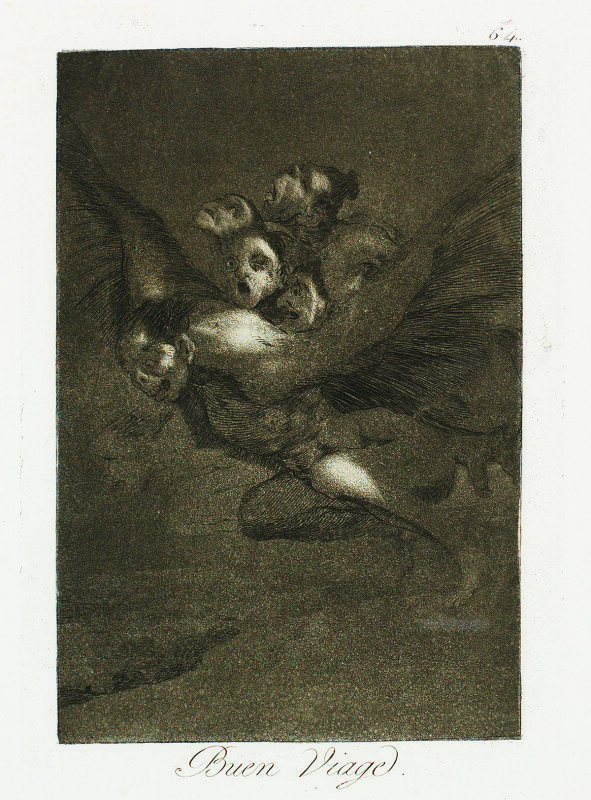 Etching from Francisco Goya’s “Los Caprichos” series. 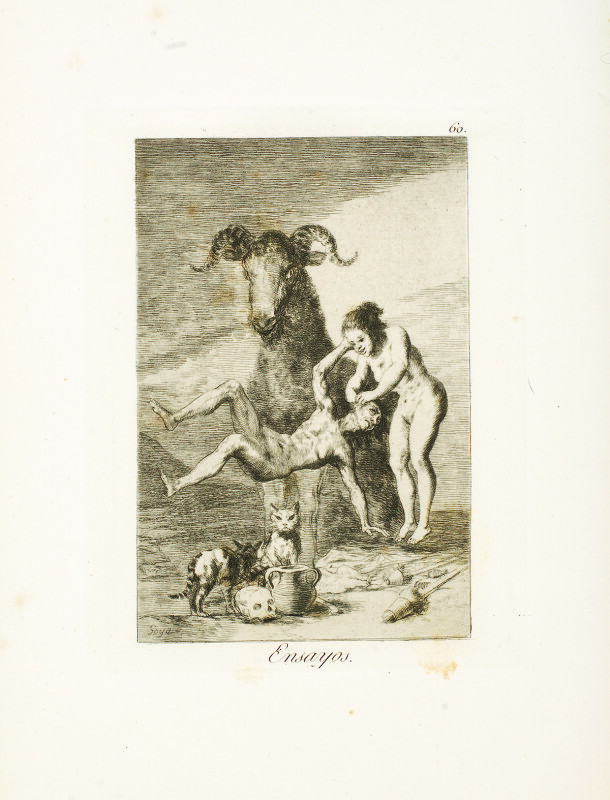 To give you a better idea of Francisco Goya‘s beautifully dark sensibilities, here are 7 of the most undeniably eerie etchings from his acclaimed “Los Caprichos” series. “Wait till you’ve been Anointed” (c. 1799). Etching from Francisco Goya’s “Los Caprichos” series. This image shows a goblin and an old hag, possibly about to sacrifice a goat. While the two figures are creepy enough, perhaps the true horror is that the goat’s leg held by the goblin ends in a human foot. “Out Hunting for Teeth” (c. 1799). Etching from Francisco Goya’s “Los Caprichos” series. Witches need to collect their spell and potion ingredients from somewhere, right? Apparently, that sometimes involves prying teeth from a dead man, which, as this image shows, is a grotesque errand. “Trials” (c. 1799). 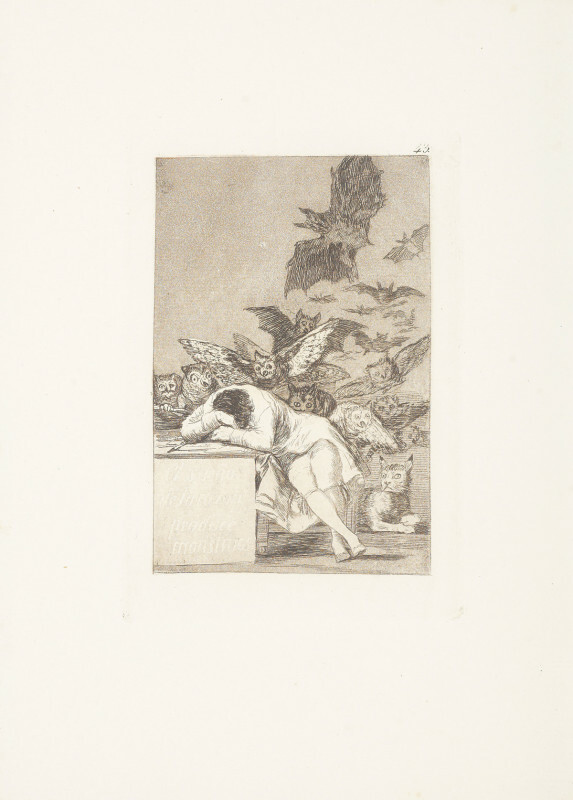 Etching from Francisco Goya’s “Los Caprichos” series. This appears to be a witch, shown torturing a man while a demonic goat watches. Though open to interpretation, the manuscript hints at this witch learning sorcery, demonstrating just how far people will go to earn money or power. “Bon Voyage” (c. 1799). 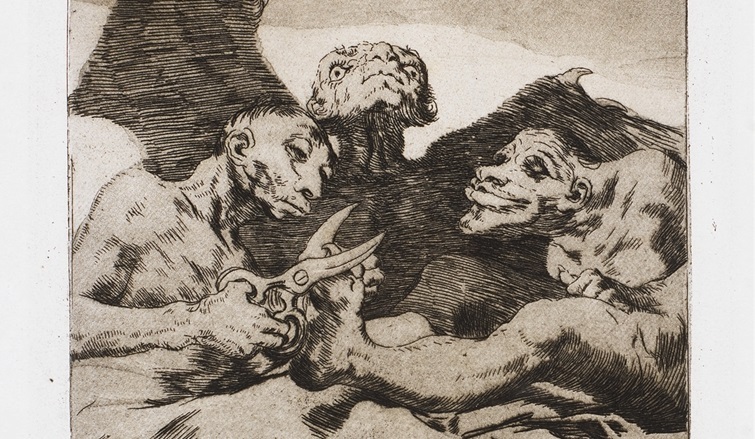 Etching from Francisco Goya’s “Los Caprichos” series. We watch as a terrifying winged creature takes flight with numerous wailing heads on its back. As the manuscript suggests, there is little doubt people would be frightened by this monster. 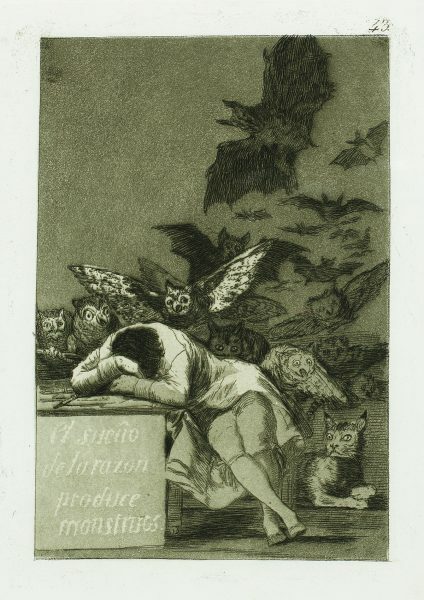 “El sueno de la Razon produce Monstruos” (The sleep of reason produces monsters) (c. 1799). 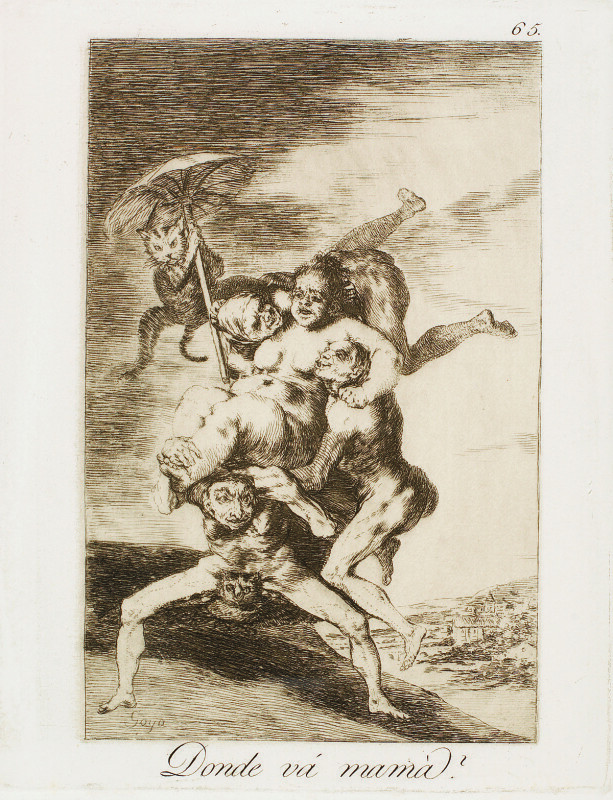 Etching from Francisco Goya’s “Los Caprichos” series. Perhaps the most iconic work from “Los Caprichos,” the sleeper is actually Goya himself. Large owls and bats flutter around the artist while a huge witch’s cat watches on. Goya’s reason is dulled by sleep and “bedeviled by creatures that prowl in the dark,” according to the Metropolitan Museum of Art. “Where is mother going?” (c. 1799). Etching from Francisco Goya’s “Los Caprichos” series. A witch is carried aloft and escorted by odd, goblin-like denizens. The creep factor is somewhat muted by the absurdity of the image, especially the cat desperately clinging to the parasol, but still, is this a mother you want to run into? “It is Time” (c. 1799), Etching from Francisco Goya’s “Los Caprichos” series. 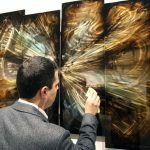 The final installation of Goya’s series is perhaps the most shocking, like the last startling image of a nightmare before waking. 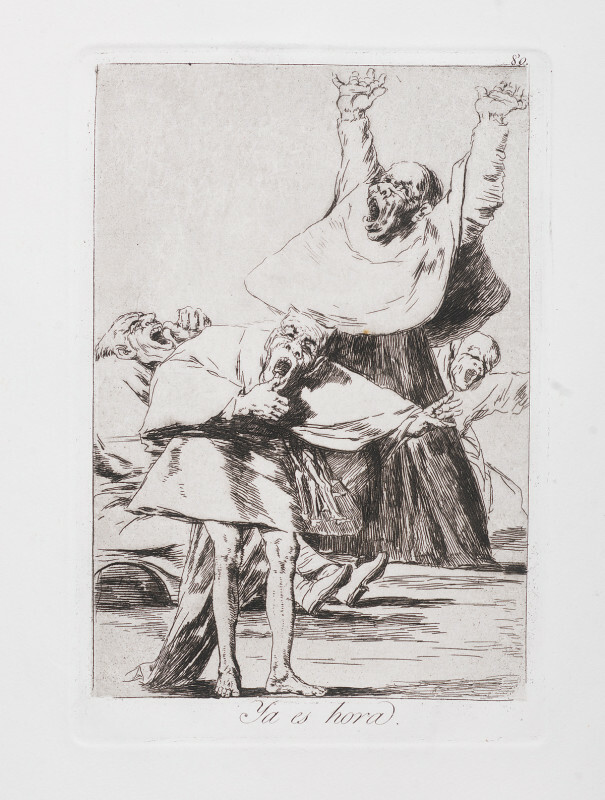 Goya blurs reality with fantasy, depicting men in clergy garments with gruesome faces. 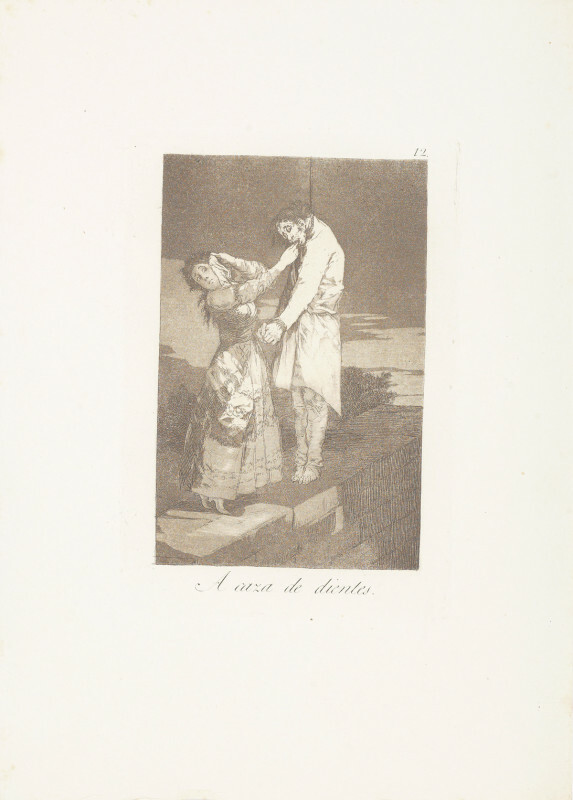 Interested in learning more or collecting works by Francisco Goya, including “Los Caprichos” etchings? Contact our gallery consultants at (800) 521-9654, ext. 4 during business hours or sales@parkwestgallery.com. You can also see selections from “Los Caprichos” in person at Park West Museum in Southfield, Michigan, just outside of Detroit. 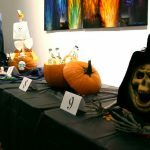 This free-to-the-public museum has works from masters like Picasso, Renoir, and Rembrandt, and includes a gallery devoted to the graphic works of Francisco Goya. You can find more information about visiting the museum here. We also invite you to watch our “Introduction to the Masters” video where Park West Gallery Director Morris Shapiro discusses Goya’s legacy. Bon Voyage, creepy art, Francisco Goya, Halloween, It is Time, Out Hunting for Teeth, scary art, The Sleep of Reason Produces Monsters, Trials, Wait till you've been Anointed, Where is mother going? On a recent cruise we noticed a Goya etching “wait until you have been anointed”c 1799. Could you please advise when the etching was printed? Was it 1799 or a later edition, as many were printed in 1886 or later.